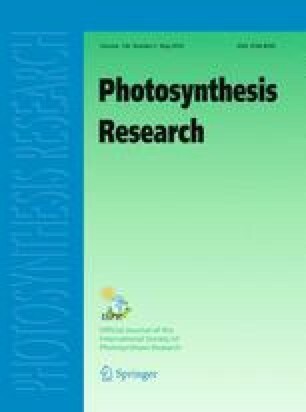 Enhancement of photosynthesis by supplemental photosystem 1-enriched (707nm) light has been investigated in intact spinach chloroplasts by the simultaneous measurement of the rate of oxygen evolution, yield of chlorophyll fluorescence and quenching of 9-aminoacridine fluorescence. Chloroplasts reducing CO2 showed a 75% increase in the rate of O2 evolution after the addition of 707nm light, whereas if nitrite was used as substrate, an enhancement of only 20% was observed. Reduction of glycerate-3-phosphate was associated with a 40% enhancement by 707nm light. There appears to be a correlation between the degree of enhancement and the requirement for ATP in addition to reducing power. Prolonged illumination in 707nm light resulted in an elevation of enhancement whereas illumination with 650nm light caused a loss of enhancement, demonstrating the operation of state transitions in intact isolated chloroplasts. 2.Research Institute for PhotosynthesisThe UniversitySheffieldU.K.